Meeples and D20 coins and more! The holidays are just about here. We hope you'll get a chance to spend quality time with family and friends, and maybe get in some seasonal gaming. That's our plan! Thanks to each and every one of you for making 2018 a record year for us. We're all ready for a short break, so we'll be closed between Christmas and New Year. Our last mail orders will go out on Monday 24 December, and our next will be Thursday 4 January. Here are some new items and other news to look forward to in the New Year. After our successful Kickstarter, our Deluxe Metal Meeples are now available on our website. These exquisite little game pieces are the same size as a regular meeple, but much heavier, and finished with different antique metal plating and gorgeous translucent enamel. There are six colours to choose from, and we have also made a nice collector pack if you'd just like to get one of each. 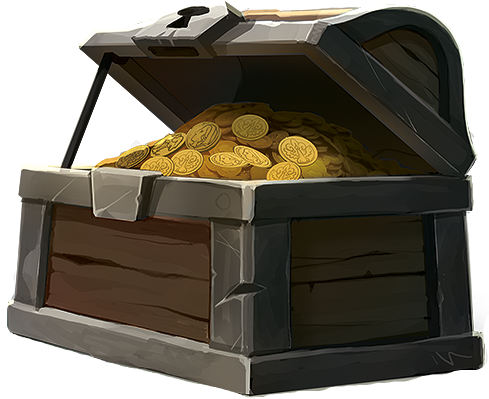 Our Epic D20 Coin pledge manager is now live at Game On Tabletop. If you backed the campaign on Kickstarter, check your inbox for the link. If you missed the campaign, good news: you can jump in now and enjoy local shipping in the US and the EU. 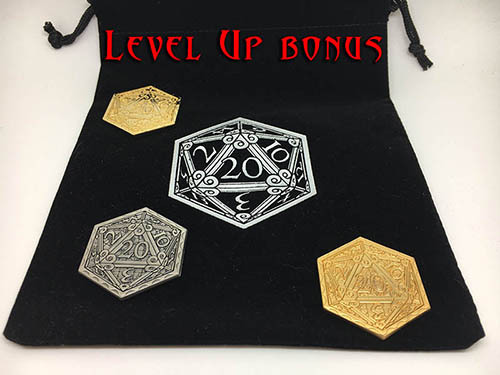 If you go in for Two Packs or more, you will also get all the level up stretch goal bonuses unlocked in the campaign: exclusive limited Epic D20 Coins in Shining Gold, Adamantine and Regal Gold, and a sweet Velvet Bag of Holding with the D20 design. The moment has passed for us to get any last minute gifts to you, but we can help you with a last minute gift certificate. You can specify the value, and we'll email you the code to use at checkout. ... and a surprise gift for a website reviewer ! 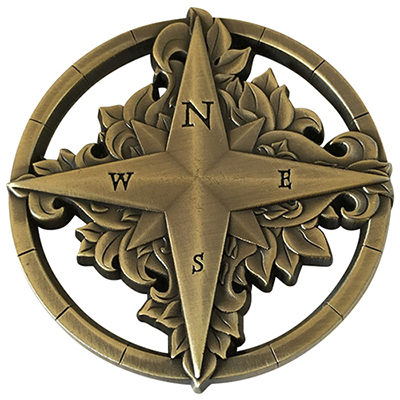 Dave Mack, thanks for your review of the Deven Rue Compass Rose, you are our first ever random review winner. We've added US $50 credit to your account, enjoy your loot! To everyone who has ever taken the time to write a review, we really appreciate it. 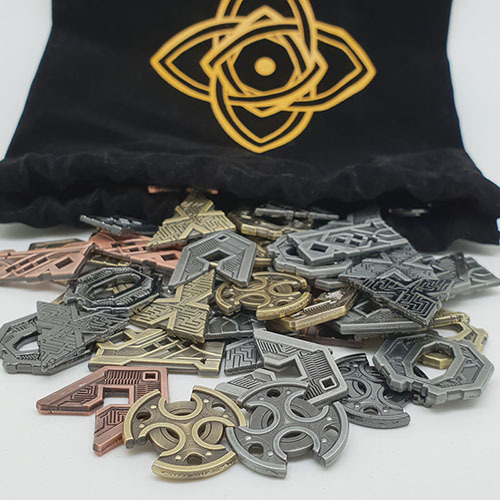 Our first release in January is our Numenera Shins coin set, made for our friends at Monte Cook Games for their hit roleplaying game. These are intricate science fantasy coins designed by Alex Ries (photo below). We will be launching our card game Rochi on Kickstarter. Designed by James Ernest and Sonia Orin Lyris, with wonderful art by Mark Ferrari, this fantasy themed gambling game features beautiful and mysterious cards with stories to tell. We are refreshing our classic fantasy Starter Sets, designed by Lee Smith. The new assortments will make it quicker to start the treasury for your RPG campaign. We'll be fulfilling and releasing our new Epic D20 Coins, designed by Lynda Mills. In April we will publish The Other Dungeoneers, brand new comedic adventures of The Three Dungeoneers from Penny, introducing three new characters to the party! We'll be crowdfunding our Glorantha coins, designed by Alex Ries. These are perfect for campaigns with the new RuneQuest rules from Chaosium. Lots more coming, watch this blog and our mailing list! Thanks for everything. You make all of this possible.